We’ve all witnessed that moment when a leader walks into a room and instantly attracts intense, positive attention. The air shifts. Heads turn. People gravitate toward them in the conversation circle. In short, they have a “wow” factor. The wow factor is often called “executive presence.” Executive presence is a blending of temperament, competencies, and skills that, when combined, send all the right signals. Leaders know they must embody executive presence to get ahead, influence others, and drive results. Leadership development professionals know they must help their executives develop it. But what exactly is executive presence? One response we often get to that question is “I know it when we see it.” Some characterize it as gravitas. To others, it’s the leader’s ability to command the room. Others explain it with a laundry list of qualities. Without a clear definition and a more scientific approach, executive presence has remained somewhat of a mystery for organizations and for leaders looking to develop it. What is intuitively understood about executive presence is that it’s all about the capacity to mobilize others to act. At the core, it’s necessary for influencing others. To become influential and lead large-scale, complex business initiatives, executive presence isn’t a nice-to-have, but a must-have quality. Through our extensive work with successful leaders, we’ve seen how essential executive presence is to effective leadership. To stand out and drive an organization forward, you must own the room, project an authentic and confident style, excite people’s imaginations, and win hearts and minds. Contrary to some of the conventional wisdom you may have heard, executive presence isn’t charm school. Appearance and nonverbal communication are important facets of presence but really just the tip of the iceberg. When you drill deeper into the science of influence, you’ll find that there is much more going on beneath the surface. Through an extensive review of relevant theory and empirical studies in management, communications, psychology, and social action theory, we’ve defined executive presence with three distinct dimensions – Style, Substance, and Character. These three dimensions are made up of 15 facets that collectively create an aura of presence that helps a leader make an impact. 1) Style is the more readily observable pillar. It’s what people see and experience about you quickly if not immediately. It’s the first impression people make of you – based on your image, mannerisms, and interpersonal behavior. Whether you like it or not, style must be congruent with what people know and believe about you and your role in the organization. If there is dissonance between your style and expectations, people judge you as ineffective. 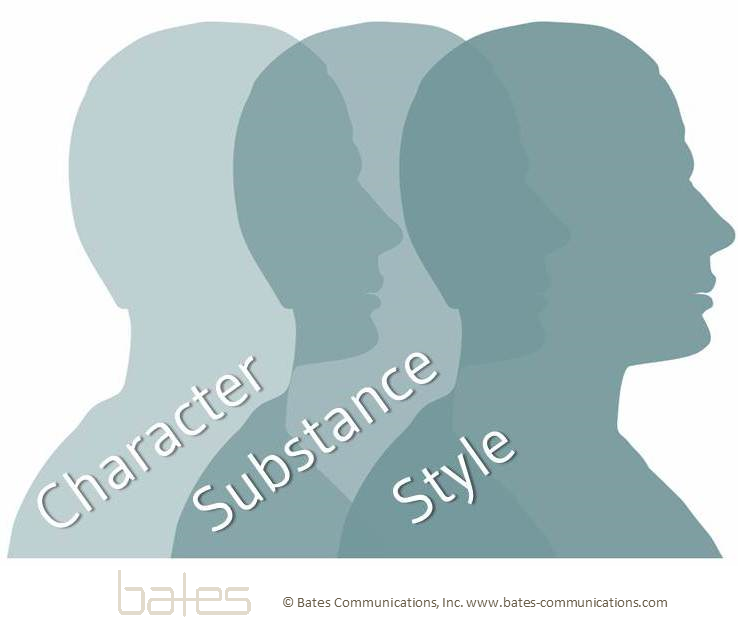 With some leaders, perceived problems with the five facets of style may prevent people from appreciating their underlying substance and character. We may “tune out” or “write off” a leader based purely on relatively superficial observations about style. 3) Character is an over-used and often misunderstood word, but in the context of leadership, character is your inner core—the personal traits and values that define you. Character is who we are from the standpoint of values, temperament, and essential beliefs about self, others, and life in general. Character is the most foundational level of the leader as a person… but it’s also the least observable. It’s made up by your courage, optimism, integrity, discretion, and priorities. As a leader, you need to not only identify and clarify your personal values but behave consistently with them as you lead your organization. The reality is that executive presence isn’t in anyone’s DNA. With the right assessment tool, it can be measured. And we’ve developed the first-ever scientific assessment of executive presence—the Bates Executive Presence Index (Bates ExPI™). Based on the results of this multi-rater assessment, it’s entirely possible to learn how to leverage your existing strengths and address elements of executive presence that may be relative weaknesses now… but that can be developed with expert coaching over time. Learn more about the Bates ExPI™, the first research-based, scientifically-validated assessment tool to measure executive presence and influence. Call us today at 800-908-8239.